How to make yourself employable in Malaysia. Despite the fact that most young job seekers struggle to find work, those who are willing to adapt and enhance their soft skills will have better outcomes awaiting them. It used to be that there would already be jobs lined up for you once you’ve stepped out of university. Nowadays though, employment is no longer guaranteed, even with having a degree. For this year, hiring is expected to decelerate. In the private sectors, employers are now holding back on hiring due to the economic uncertainties. Additionally, even the government has put a suspension on employment. Furthermore, the job pool has become more crowded since the announcement of the retirement age of 60. Consistent with the statement to Dewan Rakyat made by the Human Resources Minister, Datuk Seri Richard Riot Jaem, the number of unemployed graduates had grown from 42,954 to 52,282 between the years 2010 and 2013, in an article published in The Star last year. However, it is revealed that the figure of unemployed graduates aged between 20 and 24 in Malaysia has rocketed to an alarming figure of 161,000 or 8.8%, as stated by a minister in the Prime Minister’s Department, Datuk Seri Abdul Wahid Omar, at a Business Leaders Dialogue Session in Kuala Lumpur recently. Various reasons on why graduates cannot find employment have been weighed in by industry experts. The possible main factor is because of a mismatch of expectations. Good payment packaged with only eight hours of working per day, on a five days per week basis is what every fresh graduate dreams of. Unfortunately, this dream will be difficult to acquire because such a job scarcely exists. An online recruitment company, JobStreet.com, did a survey recently that indicates that the top reason fresh graduates don’t get hired is because they ask for impractical salaries or benefits. 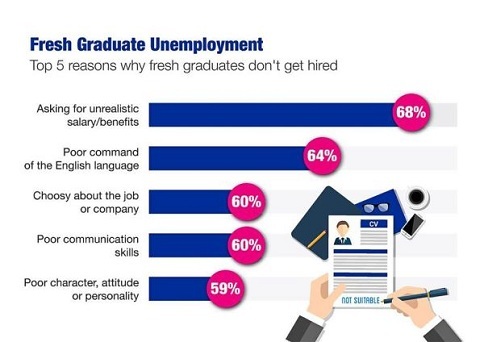 Prior to this, JobStreet.com also released a survey which revealed that 60% of fresh graduates expect a salary of RM3,500 for their first job while 30% want to be paid as high as RM6,500. The harsh reality is, the average salary for fresh graduates here is only between RM2,100 and RM2,500, indicating a massive gap between expectation and reality. Other reasons include being overly choosy about the job or company, a poor command of English, lack of communication skills, and worse, poor character or attitude. Jobstreet.com - According to JobStreet.com’s country manager Chook Yuh Yng, there is a lack of knowledge in salary benchmarking among the fresh graduates. Furthermore, they are unaware about the need to do so. It is essential for them to do a thorough research regarding this and also carefully preparing a proper career plan since it will guarantee a smooth transition into the employment market. myStarjob.com - myStarjob.com’s product manager Ahmad Yussof Aziz noted that graduates often expect too much, such as excellent remuneration, flexible working hours, and an office with a close proximity to their homes. What they should actually be looking for is a good working surroundings that offers openings for career and personal development. The managing director of a panel session titled Rethinking Employability – Riding the Tough Job Market in 2016, Google Malaysia, Vietnam and the Philippines, Sajith Sivanandan, said: “Back then, all you needed was hardware. It was very linear. Graduates just needed good results and to know about the subject of their field. It’s different now. Employees are expected to know everything.” When speaking of the job market at INTI International University and Colleges’ Subang campus recently. Another speaker, Cradle Fund CEO, Nazrin Hassan, mentioned that graduates these days are facing different challenges. The rise of the digital age has required them to not just swallow complex information, but also to digest and scrutinize it. Graduates must be universal employees with an extensive worldwide network as the world becomes more connected. Puang added that although the medium of communication in any multi-national company is English, many who come into the company struggle with the language and also lack confidence. “Malaysians are pretty insulated, so we feel uncomfortable interacting with people from other cultures,” he said. Among the other speakers at the talk were Performance Management and Delivery Unit (Pemandu) Education NKRA and NKEA director, Tengku Nurul Azian Tengku Shahriman, and Taylor’s College academic director, Hoe-Khoo Li Lin. Tengku Nurul Azian noted that graduates should be able to think quickly and solve problems. “It’s a hybrid of skills that is needed for the future. Employers’ expectations have gone up. At Pemandu, we test a candidate’s ability to analyse and synthesise data in our interview process.” Says she. She added that at Pemandu, potential candidates are given a thick case study and an hour to go through it. They will have to analyse it, and then do a presentation to showcase how much they understand. Pemandu found out that several applicants don’t have the skill of synthesising or even grasp the given data. They feel overwhelmed when they see a thick case study that is deliberately riddled with curveballs and red herrings just to test their focus. So what is the one sure way for graduates increase their employability? The general consensus of the experts is to gain working experience. Industries often pursuit for employees who have some experience in the job market, as that gives them practical experience and makes them more realistic about their working prospects. Graduates can just join in internships or attachments at various companies, and also join clubs and organisations such as the United Nations. In fact, a survey by JobStreet.com states that the top factor that gives fresh graduates an extra advantage is if they have held a leadership position. This is followed by high academic scores, involvement in extracurricular activities, and volunteer work. Sivanandan suggested for graduates to develop transferable skills which can be applied in different industries and positions to enhance their flexibility. And when it comes to interviews, preparation and the right attitude are crucial to making the cut. Tengku Nurul Azian voiced that fresh graduates have a lot of preparations to do even before applying for a job. They need to polish their skills that they would like to display during the interview. Then go in with realistic expectations. Even if the salary is not what they expect, they should just get into the industry so as to build up their skills and competency. Chook added that preparation is key. If a fresh graduate have been called for an interview, they should rehearse their answers in expectation of frequently asked questions. Developing skills often includes numerous things such as keeping pace with technology which is extremely crucial in this digital age, and also keeping up with what one’s peers are doing, especially in the international scene. As stated by Nazrin, education providers face the challenge of preparing current students to be significant two decades from now. If the world is expected to become more global, then they shouls make the connections and prepare the students to become more global. Countless institutions of higher education have stepped up their game and are relooking on their pedagogy in order to ensure the production of employable graduates. Taylor’s College, for one, has steered away from the conventional, teacher-centred approach. “These days, students download notes from our portal, then come to class for discussions. It’s like doing your homework in school, and doing what used to be done in school at home. We call this the flip classroom. Students have to take charge of their learning,” said Hoe-Khoo. Taylor’s students are often given case studies instead of the conventional two hours of theory lecture. This entails them to assemble information regarding an issue and recommend solutions before presenting it in class. INTI has also developed its teaching module by having a collaboration with companies to conduct employer projects, real-life business projects or case studies that are conducted by its students. Students will eventually develop soft skills and will be able to get a hands-on experience that they can apply in their workplace after they graduate. Even with all these efforts in place, the decision still lies in the hands our young student, the future of Malaysia because they are the ones who will decide their own future. Whether they choose to take the given opportunities or not, it is entirely up to them.